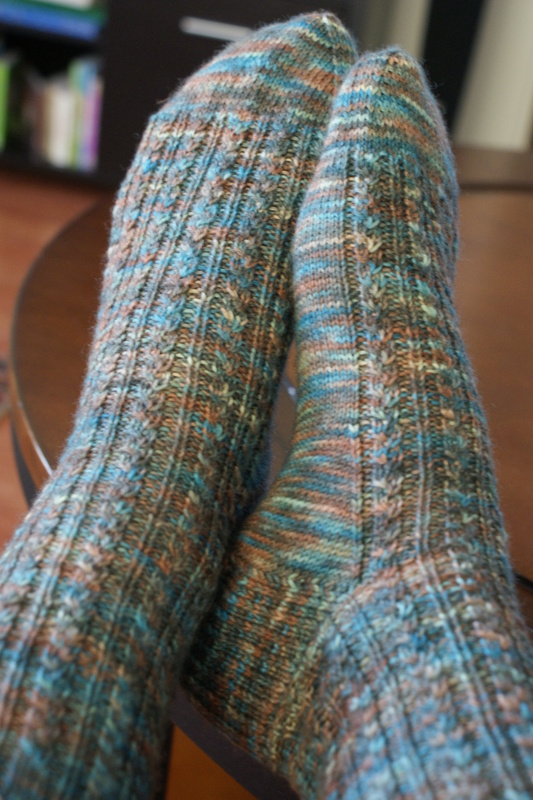 It took two and a half months, but I’m finally finished with “Conwy” – the final pair of socks from Knitting on the Road by Nancy Bush. Ranco is a simple sock yarn, an affordable 75%/25% wool/polyamide (I assume that means nylon? ), and these colors are fetching to my earthy tastes. Short color runs make for nice blending. I hear, though, that you shouldn’t use this yarn for sweaters – two friends of mine made sweaters together and once they hit water, they grew to an absolutely unwearable size. Hazards of superwash, or so I’m told. But me, I’m not going to be making a sweater out of sock yarn any time soon. Pattern Review: Gauge. Issues. Sheesh! 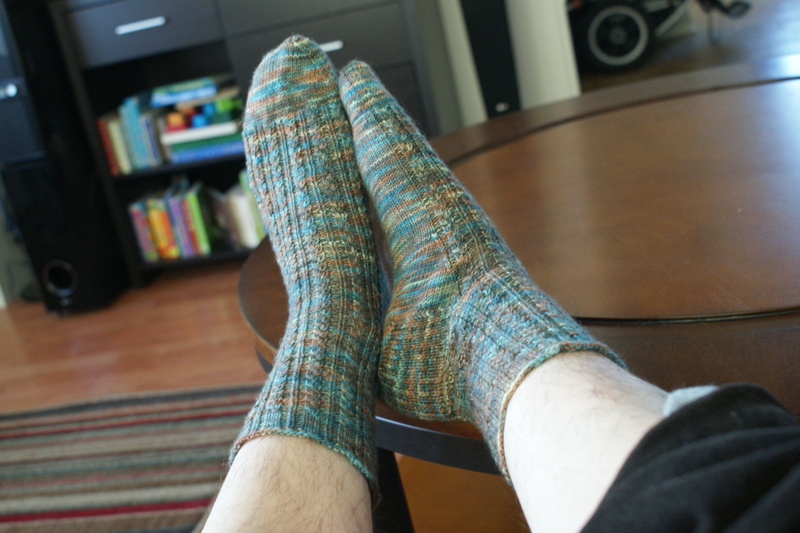 I had to alter these socks to decrease down to 66 stitches instead of all the way down to the proscribed 60 (when down to 60 I could not get them over my feet at all), and they are still very tight. 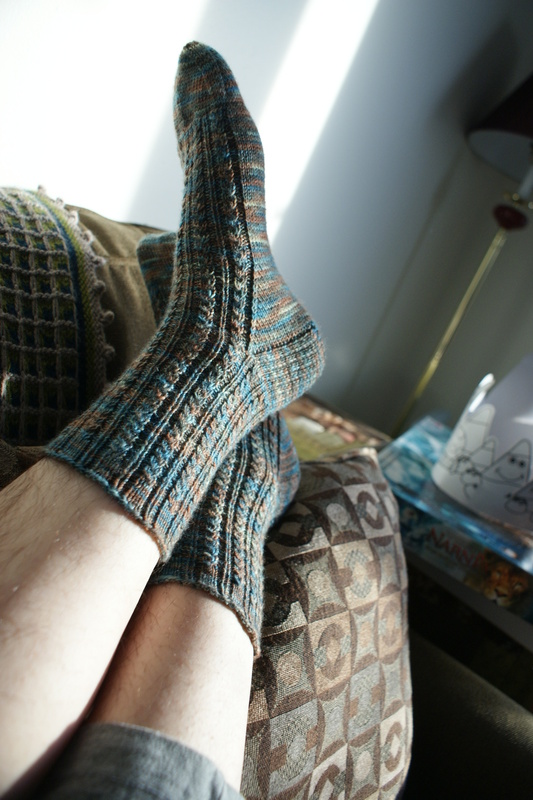 I could have gone without decreasing entirely and made the whole of each sock at a 72 st. circumference. (I do not love twisted stitches, and I was not having fun with my needles, so I decided I would make do with a tighter sock rather than more knitting.) 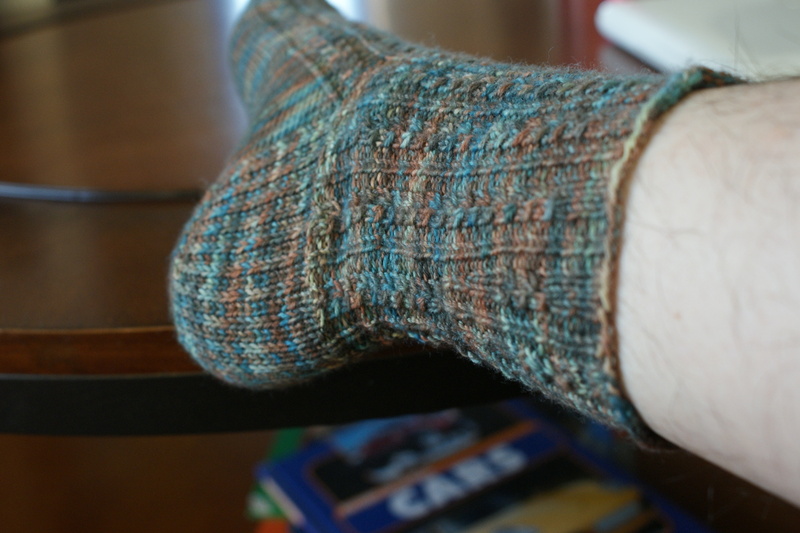 It’s possible my feet have just gotten that much wider through two pregnancies, but I’m more inclined to blame the book, since I have gauge issues with many of Nancy Bush’s sock patterns. I’m curious to see if her third book, or the new edition of Folk Socks, improves on this, but I don’t think I’ll be knitting any more socks for the next five years. All the same, I got used to the twisted stitching after a while. The pattern was so repetitive and simple that by halfway through the first foot, I could read to Naomi while knitting. She’s taken to getting long books about heavy machinery out of the library, hence why the second sock took half as long as the first. It has a simple-traditional thing going on. Because I was decreasing down to 66 instead of 60, I had to alter the pattern of calf decreases. I just fudged it a bit so that, instead of decreasing away two full pattern repeats (one on each side of the center), I decreased two pattern repeats down to one new one in the center. It doesn’t look like much, but I found it pleasing in concept. Also, taking a picture of the back of one’s own leg is still hard. 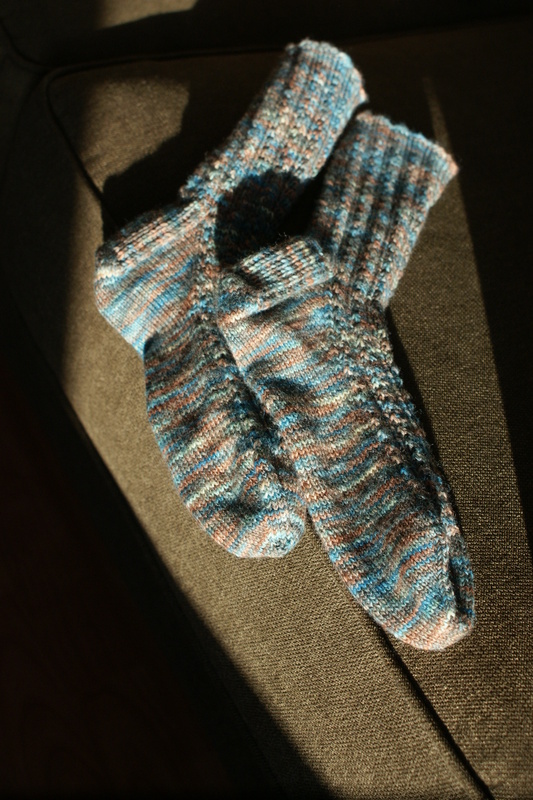 You’d think I’d have figured out a technique for it after blogging about over 30 pairs of socks. And with this pair, the book is finished. Stay tuned to see the finished work! Congratulations on finishing the book!! And the socks are beautiful. I love the colors!